Richard Nell concerned family and friends by quitting his real job in 2014 to 'write full-time'. He is a Canadian author of fantasy, living in one of the flattest, coldest places on earth with his begrudging wife, who makes sure he eats. 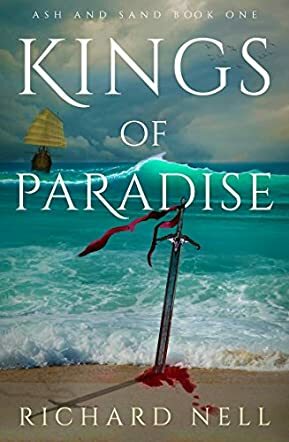 His debut novel, Kings of Paradise, is the first of an epic, coming-of-age, low fantasy trilogy, and a Canadian Amazon best-seller in dark fantasy. It's available now. He also writes flintlock fantasy! Join his mailing list for news on finished work, freebies, and the occasional philosophical rant. His mother had given everything she had to protect him. Born Noss touched, there were those who would call Ruka cursed. Children like him were not allowed to live in some places, although some northern laws protected them from the death sentence that people were all too willing to preach was right. She loved him, she believed he was a child of prophecy, one who would destroy and create the world anew. Ruka, however, believed no such things. He lacked his mother's faith in the gods, and sought only to live. But he was an outlaw, unjustly accused and unfairly sentenced. He vowed to survive, to live on for his mother. He took everything that was good and buried it in a haven of his own, making a place where he could be all he wished, a place where things in the real world didn't matter. Except they did. While Ruka tries to survive, a young prince tries to find his place in the world. Sent to the navy, unsure of his calling, Kale finds camaraderie and earns the respect of many. Before both these men lies a difficult future, one that will either save the world or see it burn. There a complex depth to the characters in Richard Nell's Kings of Paradise (Ash and Sand Book 1). I enjoyed watching each of their developments. Dala, Kale, and Ruka have very different stories, different lives, and yet all three are destined to change the world. I loved how these characters grew and changed when challenged by circumstances. Weakness becomes strength, and the power and strength of an idea is central to this story. Written with a flair befitting the world of fantasy, and with a passion the reader can't help but experience. There is so much depth to the plot, characters, world building, and hierarchy that you can't help but be drawn into this world of darkness, entitlement, and hatred. Sometimes things must be destroyed to be built anew, a theme explored in this impressive tale. Love, betrayal, loyalty, honour, sacrifice, gods and men, agendas, politics, and manipulation; what more could you ask for? A must for lovers of fantasy, especially those who enjoy losing themselves in a epic tale.